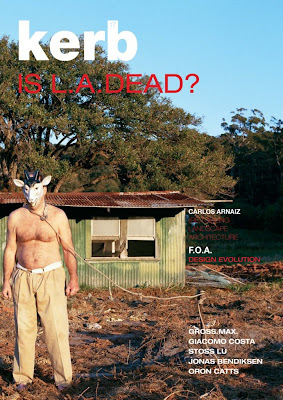 Landscape+Urbanism: Reading List: Kerb 17: Is LA Dead? 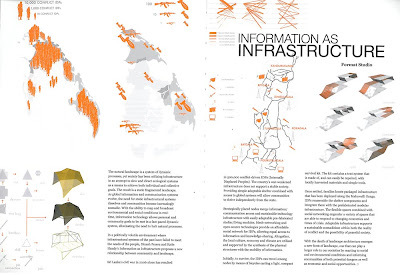 "Landscape architecture has not evolved the necessary operational agility to manage the growing complexity of regional urban infrastructures... Contemporary landscape architecture should seek to generate new performative models of infrastructural form that renew the biophysical environment while facilitating a regional understanding of market forces. Landscape architecture has failed to embrace the technical complexity of infrastructural systems in the city as a programmatic concept with as much currency as the idea of leisure or recreation"
Well, I was hoping to save this one for the best of the year lists, but figured it was time to offer up the accolades that this issue of Kerb, truly deserves. Published by RMIT, issue 17 offers a simple question that opens up a complex dialogue about the very nature of what we do. In the age of information overload and constant opportunities for reading great things, it's rare to want to take the time to re-read anything - but this issue kept drawing me back - and I'd guess I went through many of the essays at least twice. It may have been the subject matter for starters - something we grapple with on a daily basis - seeking relevance and expansion of our field. The inquiry into the health of the profession of landscape architecture isn't new (for a snapshot of this longstanding dialogue, see 'An Apocalyptic Manifesto' and the find and read much of the tepid response in the April 2005 issue of Landscape Architecture Magazine) or go further back to the art v. science debates of the late 1990s. If so, what did you achieve? What significance did you have? Will you be remembered? 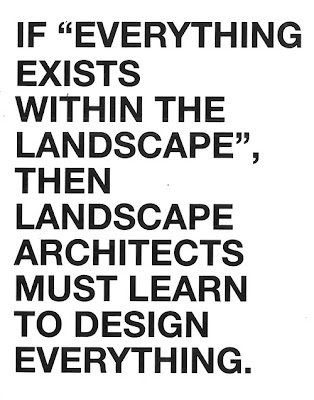 This sort of bluntness is a great to way to frame the conversation about the death of landscape architecture for a new era of practice. Rather than a rehash of the entire volume, I'm just going to sprinkle some choice quotes within some of the spreads... don't take my word for it - order it now! "Landscape Architecture is at a point of change. But if we're reliant on twentieth century capitalism and economics to drive high quality public space then I do wonder whether it might indeed be dead..."
"The 'scape' is killing the profession." 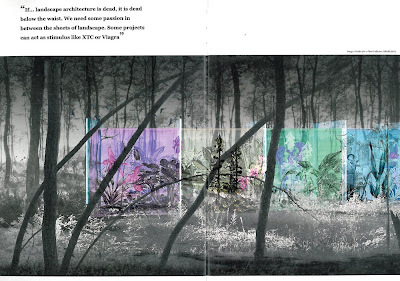 "Landscape architecture needs to resituate itself within the world. Culturally relevant and ecologically suitable places don't appear out of the ether. Their design must be based in discourses that are grounded in scientific and artistic theories, methods, and practices." "Landscape urbanism's current theoretical argument embraces flexible operations that address fluidity, non-linearity, open-endedness and indeterminacy. 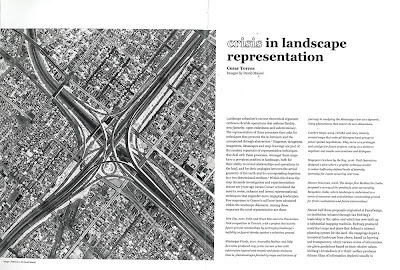 The representation of these processes then asks for techniques that promote the in-between and the unexpected through abstraction "
"If...landscape architecture is dead, it is dead below the waist. We need some passion in between the sheets of landscape. 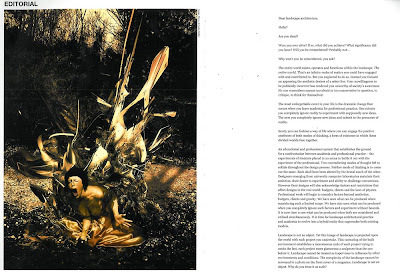 Some projects can act as stimulus like XTC or Viagra." GROSS.MAX continues to elaborate on a model of praxis that is quite compelling - giving way to a new model for the post-economic boom landscape (literally and figuratively) that exists out there in the world. Sort of a post-landscape approach focuses and accepts landscape as a commodity, and capitalizes on this fact by playing with the notions of this versus trying to recapture authenticity and precious historicity. Along with a handful of others - this paves a new path for the next wave to follow. 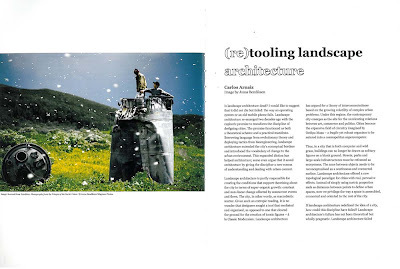 Overall this is by far one of the best collections of landscape architecture essays, not just from this year, but ever. And the fact that it came from an educational institution, versus the traditional pathways of journalism should make the current landscape architecture press stand up and take notice. Simple format, graphically rich and diverse, and an accessible cost. This is (is this?) 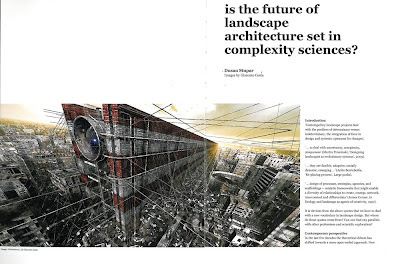 a glimpse towards future of landscape architecture media. I glad to see this discussion happening. In our current state, I see a few spots of brilliance that continue in the profession but in a general sense, practice is outdated, dying, or dead. 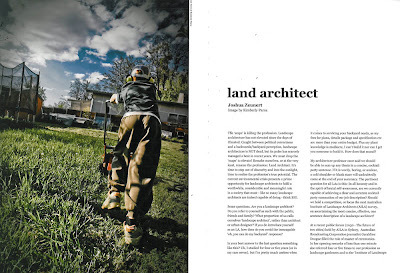 Characterized by our "signature" magazine, LAM, which has become a trade mag taking a route of safe journalism, afraid to enter the periphery of Landscape Architecture. We definitely need productions like Kerb to continue to ask challenging questions. Its a must to progress as a profession wouldn't you agree? Thanks Adam. I appreciate the link, and feel similar antipathy to the tenure of Thompson at LAM. I'm torn, as when I was back in undergrad in the early 1990s - the magazine wasn't just conservative but positively a waste of time - just back-slapping and idol worship about whichever key project was out at the time (i'm oversimplifying but you get the point). My big question is where's the vital American contribution to the dialogue...? Kerb, Topos, Jola, 'scape, etc. all seem to be cutting edge, and we are left with LAM and Landscape Journal (which an exceptional issue of Places now and then). Advertising and economics is obviously a key, but perhaps many of the high-profile magazines that have died in recent years is an indication of the shape of things to come? Could LAM be re-envisioned as something akin to an online version like Design Observer, or will blogs just finally take over the dialogue? The profession seems sometimes to be slow to change and adapt to new paradigms - so it's not a surprise that our signature publication would be the same... but I agree - it's vital to our success that the professional organization and it's magazine be at the forefront, not an afterthought, of the discussion. Thanks for your critique! I'm on the editorial team of Kerb landscape architecture journal and we'd love to send you a copy of the new issue: Kerb 18 PlastiCity FantastiCity. Jason, can you send me an email at kerb(at)ems.rmit.edu.au? Been trying to track down your contact details and this is the best I've come up with... Cheers!